Which table tennis tactics are the most effective against defenders who chop the ball? Players who use a defensive style of play generally rely on winning matches by capitalizing on the mistakes of their opponent, rather than by winning points in the way that an attacker does. So what tactics are the most effective to use against defenders? Well, let's take a closer look. At the highest level of men's table tennis, defensive style players are now very rare. However in the women's game, there are proportionally more defenders at the top level. But at lower levels of the game there are still lots of players who use a defensive style of play and predominantly play backspin strokes (also known as chop or slice). So what's the best way of playing against them? Well the first thing to remember is that before you can work out any tactics against defenders you first need to have developed your own table tennis skills to a reasonable level. Tactics are only useful if you're playing against a player of a similar standard to yourself, or a player who is slightly better than you. If you're playing against a player who is at a much higher level than you, then it's unlikely that any tactics will be effective because the difference in playing standard will be too great. So you must first improve your own standard of play. Then you'll be able to use a wider range of tactics. 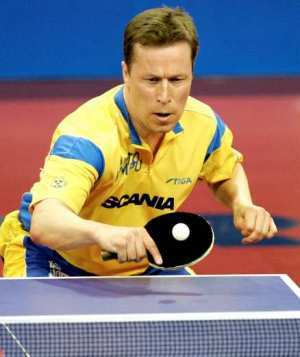 And there really is no substitute for practice in order to improve your own table tennis skills. By practising more, you'll improve your chances of success. You'll also improve your consistency, and one of the best table tennis tactics that you can employ is simply to keep the ball in play for longer than your opponent. By becoming consistent on all your strokes you can often win points by default, because your opponent will make unforced errors. So ideally you need to practice against a player who can consistently keep the ball in play and is able to direct the ball to specific areas of the table tennis table. Alternatively you could use a table tennis robot instead of a person to practice against. Here are some practice drills you can use to help you improve your table tennis skills. After you've developed your own skills, you can then start to look at tactics you can use against different opponents. But different tactics will be needed against different styles of play. Most players who are defenders rely on playing at a speed which suits them and which enables them to get into a good rhythm. They'll also try to vary the spin, speed and placement of the ball in order to out-manoeuvre their opponent. Defensive style players will also tend to be very consistent and are able to keep the ball in play for longer than many players who use an attacking style of play. Defensive players who play at a higher level will also have very good attacking strokes within their repertoire of strokes, and they can therefore capitalize on any weak returns played by their opponents. In order to stop a defender from getting into a good rhythm you must vary the placement, speed and spin of your returns. If the defender plays at their preferred pace you'll probably lose because they'll keep the ball in play for longer than you will. So the number one tactic against defenders is to make them move around a lot. This means you need to play a mixture of long and short shots, and a varied mix of angles. However you must never be predictable in your choice of shots as this will allow the defender to take the initiative. A defender will usually try to vary the amount of spin on their returns and thereby cause the attacker to make an error. So it's important that you carefully watch the amount of spin on the ball and if the defender plays a return with no spin (also known as a float), that you try to attack it hard. Another tactic against defenders is to find their weakness. You should always try different shots against defenders in order to establish where their weaknesses are. One weakness could be their inability to attack. Some defenders do not have any attacking strokes at all, so if you play the ball high over the net they are unable to attack it and they may play a very weak return which you'll be able to attack. Of course a good defender WILL have good attacking strokes, but you should always test them on more than one occasion. If they appear to be able to attack, and successfully play one strong attacking stroke, don't automatically assume that they can do that every time. Test them several times, because the first one may not be repeated. Additionally, you must be looking to win the point as quickly as possible. A chopper likes to play away from the table and get into a nice rhythm. So another good tactic against defenders is to play short length shots which keep them close to the table early in the rally, and then play long fast shots into their body down the middle of the table. This will stop them from getting excessive spin on the ball because they won't be able to play a long stroke action in order to generate the spin. You can also use this tactic straight from your service. Keep the ball short when you serve and then play fast long attacking strokes down the middle of the table. There's loads more detailed information about how to improve your service and how to serve in order to help you attack first in my book entitled "Service Secrets".